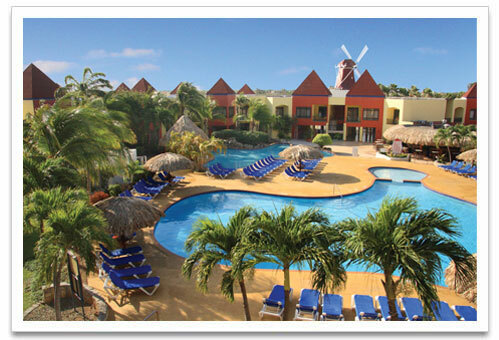 The Mill Resort and Suites is a low rise resort located across from beautiful Palm Beach. This resort features 200 clean and inexpensive guest rooms. There is a large outdoor swimming pool, poolside bar, a children’s pool, sauna, steam room, Health Spa, Fitness Center, gift shops, complimentary parking, restaurant and bar lounge. High-speed Internet access is available in public areas. Within walking distance from the high rise hotels, casinos, and restaurants. The spacious guestrooms are air conditioned, comfortable and safe. They include, ceiling fans, blackout curtains, clock radios, desks, coffee/tea makers, refrigerators, voice mail and in room safes. The bathrooms have complimentary toiletries and hair dryers. Each guestroom has television with premium cable channels. Cribs and rollaway beds, irons/ironing boards and wake-up calls, as well as housekeeping are available on request. Royal guestrooms feature one king size bed, large mirrored bath with Jacuzzi and shower, mini-fridge, coffee maker, sitting area, ground-floor patio or first-floor terrace. One Bedroom Suites feature two king size beds, two bathrooms, full kitchen, stove, refrigerator, coffee maker, toaster, blender, microwave, dining/sitting area, ground-floor patio or first-floor terrace. Supersaver guestrooms feature special rates for a run-of-the-house room with queen-size bed (some with sofa bed), bathroom with shower, mini-refrigerator and coffee maker. JR Suites feature one king size bed or two double beds with sofa bed, bathroom with shower/tub, kitchenette, stove, mini-fridge, coffee maker, toaster, blender, microwave, ground-floor patio or first-floor terrace. Studios feature one king size bed, (some with sofa bed), bathroom with shower, full kitchen, stove, refrigerator, coffee maker, toaster, blender, microwave, dining/sitting area. Two Bedroom Suites feature two king beds or one king bed and two double beds, two bathrooms, full kitchen, stove, refrigerator, coffee maker, toaster, blender, microwave, dining/sitting area, ground-floor patio or first-floor terrace.